Madhya Pradesh is one of the famous states of India. It is also known as ‘Heart of India’. It is well known for its education in the field of engineering. It has top colleges such as IIT, IISER, ITM and many others. Bhopal is the capital city of Madhya Pradesh. Students can pursue UG level to Ph.D level courses in the colleges of MP state. The literacy rate of Madhya Pradesh as per 2011 is 70.6%. 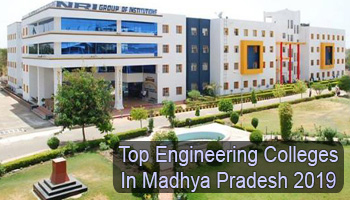 Here, we have mentioned the Top Engineering Colleges in Madhya Pradesh 2019. If you have any other queries about Top Engineering Colleges in Madhya Pradesh 2019, you can leave your comments below in the comment box.